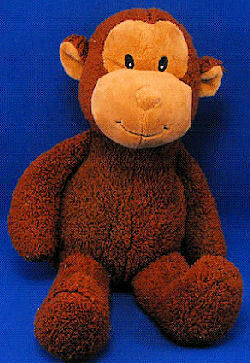 I have a five year old daughter who has had this monkey since she was born. She carries her JoJo everywhere. I have a one year old niece who has also fallen in love with JoJo, and she cries after my daughter’s. I’m looking to purchase two – one for my niece and another for my daughter if possible. Thanks, Tara. Sent to the mailing list. Thanks, Carrie!! Long mailing list for this one, as it’s always so expensive when it shows up. Thank you for collecting all this information. I was able to get the monkey off ebay for cheap! My daughter will be so delighted! I can’t wait to give it to her. Thank you so much for this wonderful service! ebay #190692013586 buy now $28.99 or make offer. Here’s one on Ebay – kind of expensive, but good condition. Thanks, Carrie!! Sent in time. Thanks, Carrie. Sorry it’s taken me so long, but I did send the link to the more expensive one to the mailing list. ebay #251310449825 lower buy it now price than usual. Good luck!